In Microsoft Planner, once your task has a start or due date, you can see it on a calendar in Planner using Schedule view. You can also choose to see your Planner calendar in Outlook. After you add tasks in the Board view of Planner, you can see those that have start or due dates by choosing Schedule at the top of your plan. Grab the right end of any task to stretch it over two or more days. Tasks without start or due dates are listed to the right of the calendar in the Unscheduled tasks list. Drag these tasks onto the calendar to quickly add due dates. 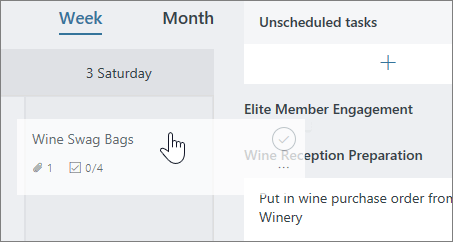 You can sort the Unscheduled tasks list by Bucket, Assigned To, Progress, and Category using the Group by drop-down above the list. If you want to remove a task from the calendar, you can drag the task back to the Unscheduled tasks list. Dragging a task back to the Unscheduled tasks list will remove the start and due dates from the task. You can also remove a task from the calendar by opening the task and deleting the contents of the Start date and Due date fields.